The Lintech 160 series linear positioning tables are designed to maximize performance while minimizing physical size and cost. 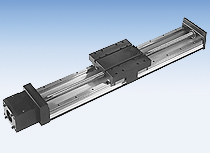 These linear motion tables use a low friction, preloaded, recirculating linear ball bearing system, which ride on precision ground linear profile rail guides. The linear square rails are mounted to an extruded aluminum base, which offers a rigid support over the entire travel of the table's carriage. The user load is mounted to the carriage by using the carriage's T-slot and with T-nuts. There are 38 different acme & ball screw options that offer high efficiencies and long life at an economical price. These linear positioning actuators are designed to allow for numerous options. They include EOT & Home switches, linear & rotary encoders, power-off electric brakes, motor wrap packages, and versatile mounting brackets for multiple axis applications.